New York City is arguably as well known for its night life as it is for its extensive, deep-rooted history. If you’re visiting NYC and want to take in the city’s past without the formality of a museum or guided tour, why not have a drink at one of the many historic NYC bars? Happily, many historic bars and restaurants are still operating, especially in Lower Manhattan, the oldest part of the city. Let the imbiber beware: Some bars make unsubstantiated claims about their history and famous patrons to draw in unwitting visitors. From Revolutionary War-era taverns to Prohibition-style speakeasies, here are some of most authentic places to grab a beer while drinking in some history. 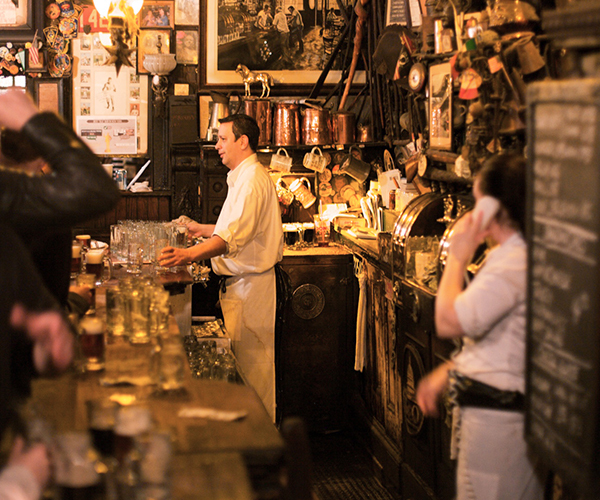 The same family has run this this historic East Village bar for more than a century. Forget the distractions of the TV, radio, and fancy cocktails—McSorley’s offers only two varieties of beer: light and dark. Open since 1854, it the might be closest you’ll come to time-traveling during your visit to Manhattan. Many establishments claim the title of “Oldest Bar in New York City,” but few have as sound a claim as Fraunces Tavern. The restaurant and bar opened in 1762, and George Washington himself used it as a headquarters during the Revolutionary War. You can peruse the attached museum’s collection of Revolutionary War-era art and artifacts before sipping one of the tavern’s 200-plus varieties of whiskies. The Stonewall Inn helped spawn the 1969 riots that led to the modern LGBT rights movement. The original bar closed after the landmark demonstrations, but reopened in 1990 in its original Greenwich Village location. Today, the Stonewall exists as a gay tavern, as well as a kind of pilgrimage site for the LGBT community. This Prohibition-era speakeasy dates to the 1930s, complete with a disappearing bar and secret wine cellar. The 21 Club is perhaps best known as a hangout for several generations of celebrities, from Humphrey Bogart to Bill Gates. The club’s lounge is the perfect spot for anyone looking for a fun night out with a touch of old school glamour. Unfortunately, numerous of the famous bars and jazz clubs of the Harlem Renaissance of the 1920s and ’30s have long since closed. One such establishment, Minton’s Playhouse, known as a spot for jam sessions by jazz greats like Thelonius Monk, Ella Fitzgerald and Louis Armstrong, came back to life in 2014 as Minton’s. The new version features updated soul food and a contemporary cocktail menu, as well as live jazz on the weekends. This historic West Village tavern opened in 1880 but came to prominence in the mid-20th century as the primary haunt of Dylan Thomas, Jack Kerouac, James Baldwin and other literary greats. Despite its intellectual significance, the White Horse maintains an unpretentious, low-key vibe. While many historical bars in New York catered to the rich and famous, the place now known as The Ear Inn counted its main clientele as sailors and pirates. The circa 1770 building was originally built as the home of George Washington’s aide James Brown. The upstairs apartment transitioned from a boarding house to smuggler’s den to brothel, with food and drink being served downstairs. The Ear Inn is said to be haunted, but the risk of upsetting any ghosts is offset by the bar’s welcoming vibes. The Algonquin Round Table, represents physically large table in the hotel restaurant and the name of the group of New York City writers and wits (which included Dorothy Parker and The New Yorker magazine founders) who once gathered there. You can dine in style at the Round Table Restaurant, or sip a vodka gimlet in the hotel’s equally historic Blue Bar. Feeling thirsty? Plan your trip now. Discover IHG hotels in New York City and book our special rate today.